This Grilled Steak Marinade paints each and every bite of your flame-grilled steak with incredible flavor. Quick and easy to prepare, it is an effortless way to improve your next cookout! In the dark ages prior to the advent of social media, the best way to passively aggressively brag to your friends about how great your life is was to simply grill steaks in your backyard. Nothing quite said, “My life is perfect right now” like the fragrant aroma of sizzling beef wafting down the street without an invitation attached. Today, however, we simply have it too easy. We can slap pictures of our every bite on facebook, or if you are feeling particularly uppity, you can even start a food blog. However, I still contend nothing quite competes with the smug satisfaction of your own perfectly grilled marinated steak. Does Marinating Steaks Make it More Tender? 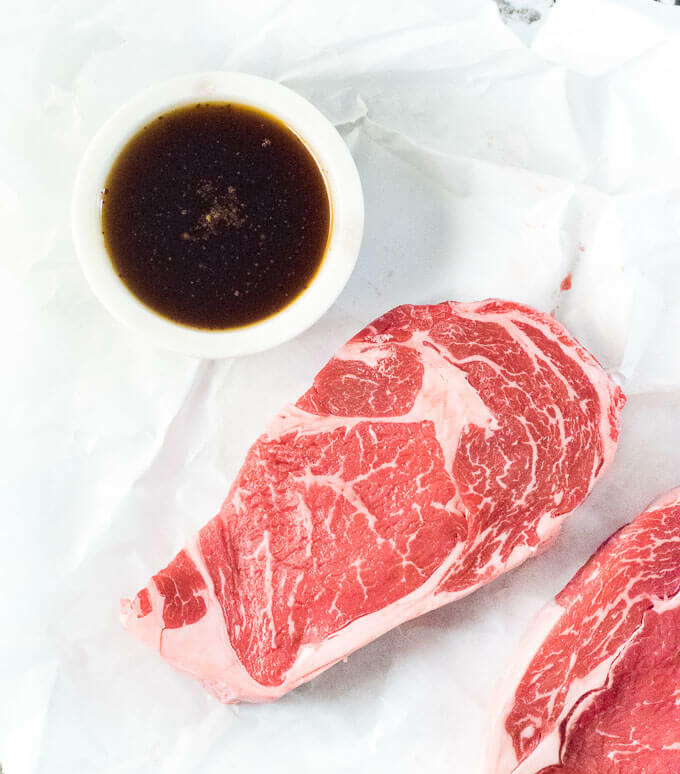 Contrary to popular belief, marinating steaks does not make the meat more tender. Even after soaking the steak in marinades for days only the outer 1/8″ of the meat gets saturated with marinade. The reason for this is because meat is filled with water and marinades are oil based, since oil and water don’t mix, the marinade never fully penetrates the meat. This is different than say a brine, which uses a combination of water and salt to get deep into the meat. A grilled steak, however, would not taste good brined. If marinating steaks doesn’t tenderize the meat, why marinate? Simple, it tastes really good! Just because the marinade doesn’t completely penetrate the meat, doesn’t mean you aren’t still adding a ton of flavor. 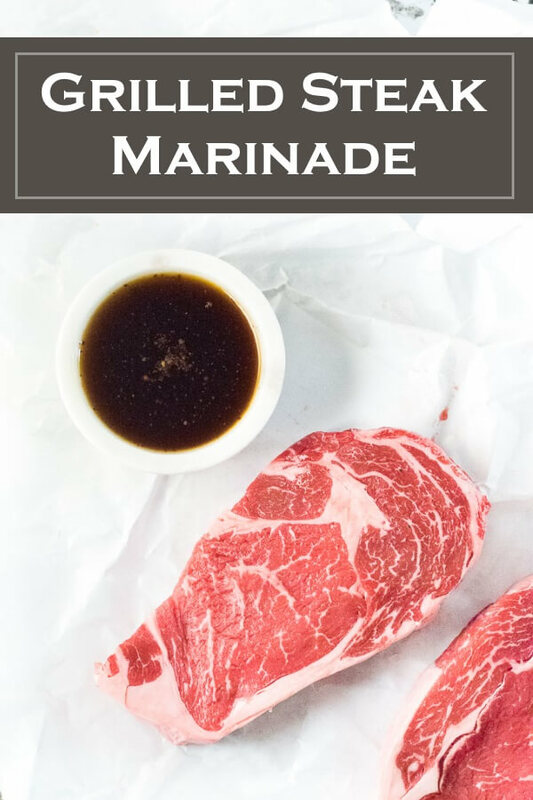 The marinade will still fill every nook and cranny on the surface of your steak, and it makes an excellent sauce to paint on the finished steak too! How Long to Marinade Steak? Ideally, I find marinading steaks for two hours to be sufficient. This is plenty of time to allow the surface of the meat to drink in the flavor. Although, if you are short on time, even bathing in the steak marinade for a few minutes is better than nothing. On the flip side, can you marinate a steak too long? 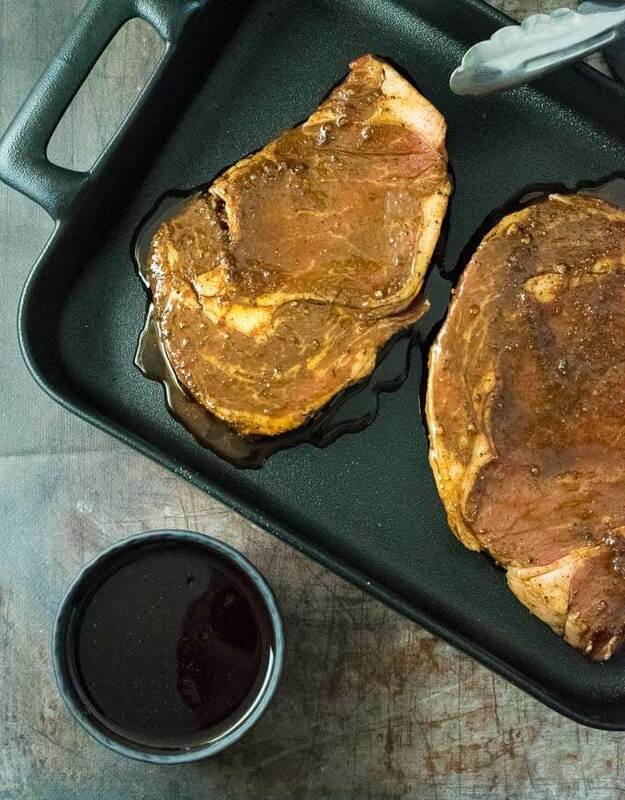 Yes, the vinegar in steak marinades can damage the meat if left soaking for too long. The meat will soften excessively and become mealy. Soaking in a marinade longer than 8 hours is unnecessary. 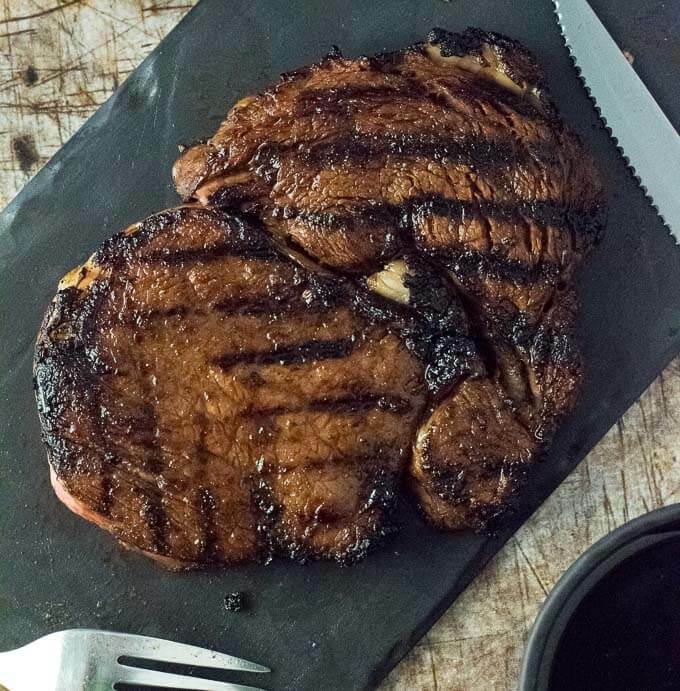 My Grilled Steak Marinade contains a blend of tangy balsamic vinegar, salty Worcestershire sauce, bold seasonings in an olive oil-based marinade. This marinade is well suited to enjoy with the deep smoky flavors of grilled steak, however, it would be excellent even on a pan-seared steak as well. I have previously written about how to cook a frozen steak, however, a marinade wouldn’t work well for this application. I would recommend painting it on the steak at the end of cooking instead. My Grilled Steak Marinade does not require any cooking. It simply needs to be whisked together and poured over the meat. Though some people do this in a dish, I find using gallon zip-lock bags to be the best choice. The marinade more easily coats the entire surface of the meat, rather than pooling at the bottom of the dish. Once your steaks and marinade have been added to the bag, let it rest in the refrigerator until you are ready to fire up the Weber and grill steak! Pour marinade in gallon zip lock bag with 2 steaks, ensuring they are fully coated and refrigerate 2-8 hours. Scale the recipe up as needed for more steaks. Pair your grilled marinated steak with Grilled Dijon Potatoes and Grilled Corn on the Cob! If you enjoyed reading my Grilled Steak Marinade recipe then you should probably like me on Facebook and follow me on Pinterest too. That’s what I would do at least, because if you don’t get to know me but you still use my recipe it is kind of like taking candy from a stranger, and your mom taught you not to do that. Don’t disobey your mom, subscribe to Fox Valley Foodie today. Oh, the smell of a steak going on that open grill. Mind you that I have a gas grill, but there really is something to the smell of a charcoal grill, as well. I have contemplated getting one just so I can get that flavor on occasion. Seriously! I’ve been bugging my wife about how much I love that smell all week long!